For months, teams have been preparing for the opening of the new Texas Children’s Heart Center® in Legacy Tower. The outpatient clinic went live on September 18. And this week, Move Day into our inpatient space has finally arrived. Before the flurry of activity, we had the opportunity to sit down with new Chief of Congenital Heart Surgery Dr. Christopher Caldarone, who shared a little about his background and his vision for the No. 1 heart center in the nation. Tell us a little about yourself. Where’d you grow up? Were you always interested in medicine as a career? How did that lead to your interest in surgery? How does it feel to be a part of the team at Texas Children’s? What was it about Texas Children’s that attracted you? Why is multidisciplinary collaboration so important? How does the layout of the new Heart Center help facilitate improved interaction? You have an active translational research background. Will you continue to build on that? What’s something you want people reading this to know about the leadership team’s vision for the Heart Center? “I want people to know that the Heart Center leadership is dedicated to creating a shared stewardship model, through which we work together to identify specific targets, pool our resources and act upon those targets as a unified group. The model makes collaboration the expectation rather than the occasional nice outcome. In most other institutions, collaboration can happen; there’s nothing to restrict it. But if it doesn’t happen, it’s a silent failure and a missed opportunity. Time for rapid fire: What’s your favorite film? What are you listening to right now on the way to work? 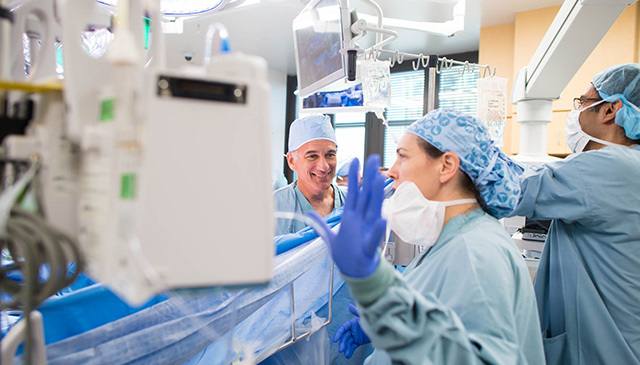 Caldarone is an internationally recognized leader in congenital heart surgery and most recently served as surgeon-in-chief at The Hospital for Sick Children in Toronto. He received his undergraduate degree from Johns Hopkins University and his medical degree from Columbia University, and he completed his general surgery and cardiothoracic surgery residencies at Beth Israel Deaconess Medical Center/Harvard Medical School. He also completed a fellowship in congenital heart surgery at The Hospital for Sick Children. Caldarone is a member of the American Association for Thoracic Surgery, the Society of Thoracic Surgeons and the Congenital Heart Surgeons’ Society. His specific research interests include the role of apoptosis related mitochondrial dysfunction and remote ischemic preconditioning as mediators of reperfusion injury. Most recently, Caldarone has focused on pulmonary vein stenosis and tissue engineering of pulmonary valves.